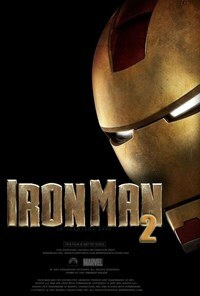 'Iron Man 2': It's Not About Me Or Is It? Iron Man 2 careens between self-awareness and self-promotion, which is not to say these are opposite conditions. Scarlett Johansson looks excellent in her catsuit. It's black and sleek, with a utility belt slung low on her hips. Her red hair is stylishly tousled, her eyes dazzlingly green. And as she makes her way down a hallway full of thugs in uniforms, she's alternately bored and focused, always utterly efficient, dispatching her opponents with predictable panache. Yes, Johansson's Natalie is sexed up, fierce, and cartoonish. She's in an Iron Man movie, after all. She's striking even when walking: on her way inside a swank event with her boss, Pepper Potts (Gwyneth Paltrow), the camera watches their two sets of hips sway up a set of monumental stairs. This sequel, like so many sequels, offers more of everything that seemed special in the first film: more explosions, more rich guys, more robots, even more Iron Men. It's a lot of more. Iron Man 2's awareness of this perennial problem is apparent from the moment the hero first appears. Iron Man takes a leap from a plane into the night sky, hurtling to the World's Fairground at Flushing Meadows Park, where he lands with a big-boomy thud on a stage. Phwoot! Surrounded by pyro effects, dancing girls, and cameras, Iron Man digiti-removes the suit and stands before a crowd as Tony Stark, CEO of Stark Industries and star of the Stark Expo, where the key message is his greatness. Iron Man, he reminds his cheering fans, has bestowed peace on the planet, saved the economy, and oh yes, hasn't met "anyone who's man enough to go toe to toe with me on my best day." But, he adds, "It's not about me." As the crowd at his feet roars some more, you laugh, because you know better. It is about him, absolutely, now and ever. That's the charm, and the rub, of this franchise. The man who will make this built-in problem (or challenge) extra clear is Ivan Vanko (Mickey Rourke). He's got a beaten face and body as well as a grudge, based on his father's problem with Tony's father. He's also got access to the Starks' technology, as the two dads conceived it together (no moms in sight). Just as Tony is introduced while descending to earth from above, Ivan first appears screaming to the heavens over his father's death. Then, at the same time that Tony sits before a Senate hearing (headed by Garry Shandling), denying access to his tech (because, as he insists, he is Iron Man, and refuses to be an indentured servant to a militaristic U.S. government), Ivan proceeds to build his own high-tech self, based on the dads' blueprints. Ivan's alterna-self is Whiplash. His collision with Iron Man is set on another global stage, the Monaco Grand Prix. Tony's driving a racecar and Whiplash walks onto the track, daring Tony to fight by whipping other cars into crashes. The point of Whiplash's show is actually a little ingenious, for it shows -- on TV -- that, despite Tony's claim that the Iron Man technology is his alone, ownership is disputed. That Tony has trouble with sharing is not news. Because he's a comic book character, this psychological tic stems from his feelings of abandonment by his dad. Because he is played by Robert Downey, his wrestling with this issue isn't so dull as it might have been. As the two sons fight over their shared legacy, the movie, so interested in doubling, is also caught between two plots. One is a regular superhero's plot. The other is the meta-plot, the plot about who has rights to Iron Man. This is hinted at in Tony's commercial extravaganza, in Whiplash's revenge, in Natalie's role (she's not actually only a legal assistant), and in the U.S. government's desire to own and exploit everything and everyone. More broadly (or more meta), this metaplot is about the commercialization of superheroes. Given the current trajectory and proliferation of superhero franchises, this seems a worthy plot to sort out. As in the first film, Tony's acting out is frequently entertaining: he quips, he complains, he drinks too much. As Rhodey tries to contain him physically and Pepper and Natalie scamper to contain brand damage, Tony meets yet another scolding father-figure, Nick Furey (Sam Jackson). "You can solve the riddle of your heart," instructs Nick. Reminded that he needs to live up to expectations, develop progressive (aggressive) technologies, and maintain Iron Man as a force for good, Tony eventually comes to his senses, just in time to fight with War Machine against Whiplash and a team of bad drones. Throughout, Iron Man 2 careens between self-awareness and self-promotion -- which is not to say these are opposite conditions. If the father-son plot is sentimental and tedious (and unfolds much too slowly, as you get what's up long before supposed genius Tony does), it's probably unavoidable, given the source material and the fans' expectations. Still, you wish someone could have come up with smarter, more engaging and engaged uses of Natalie, Nick, and even Ivan (Rourke is pretty awesome, embodying yet another version of his own self-battering history). As Tony phrases it, Natalie is "unbelievably good at this," meaning, essentially, everything. She's astute, exquisite, and righteously impatient with his whining. Unfortunately, as she's only just shoehorned into this noisy boys' business, she's not doing any of it enough.